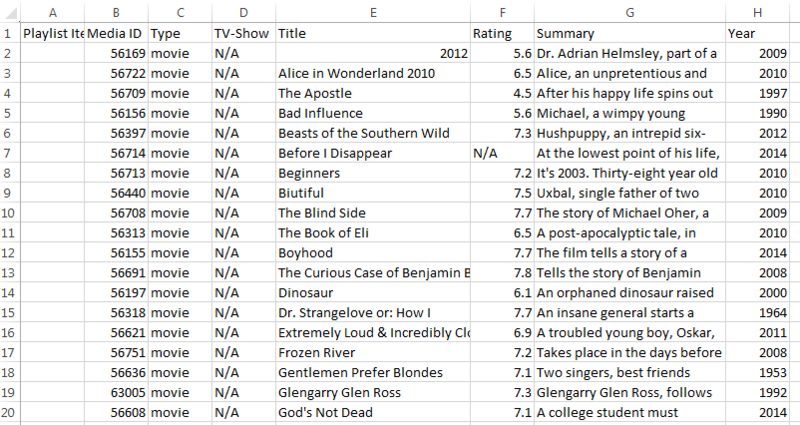 I wanted to make a list of my owned movies in Excel (for reasons we’ll not bother going into now) so after much Googling I managed to find a way to pull a list from Plex from here, documenting it here so that I can come back to it later if I need to. Then the command arguments are the same but the path is different. e.g. The built in tools export a simple list of all movie titles in your library. Unfortunately I need to be able to filter on ‘watched’ so this didn’t help too much. I really liked this one since you don’t even need to run it on the same machine as your Plex server. My Plex server is on my HTPC but I also have a Ubuntu based NAS in the house which I use for various things including a webserver so it is perfect of hosting this script (note, you don’t need a webserver to run this script). You do need to have php installed on whatever system you are running Plex Export on though. You can leave out the -plex-url argument if the script is being run on the same machine as your library. You can actually edit the cli.php file and permanently change the url if you want. Once Plex2CSV is installed go and find it in your channels list in Plex. Click on the settings icon and set the output directory, if you don’t set this then you can’t export playlists only whole sections in their entirety. You can also change the level of detail to be exported but I haven’t played with this yet. It’s also worth playing with the settings again and changing the level of detail to see what other details you can export. Thanks for this!!! This is exactly what I wanted – I just wanted to figure out which files plex was not mapping. Using the directory listing and comparing with the plex listing I can get the unmapped files. Awesome! As you prefer something startup new? Open and look at this site. Only there the choice of girls for every desire and completely free! They are responsible slaves, they will and want perform anything you say ! Installed php per instructions elsewhere.